A new, in-depth review on the synthetic sweetener sucralose (marketed as Splenda), published in the journal of Toxicology and Environmental Health, is destined to overturn widely held misconceptions about the purported safety of this ubiquitous artificial sweetener. Found in tens of thousands of products and used by millions of consumers around the world, sucralose’s unique ability to dissolve in alcohol and methanol as well as water, makes it the most versatile and therefore most widely used artificial sweetener in production today. And yet, its popularity is no indication nor guarantee of its safety, as is evidenced by the widespread use of other artificial sweeteners like aspartame, which while being safety approved in 90 nations around the world, has been linked to a wide range of serious health conditions including brain damage. Already this year, the Center for the Public Interest in Science downgraded Splenda from “safe” to “caution,” citing their need to evaluate a forthcoming Italian study linking the artificial sweetener to leukemia in mice as a basis for their decision. Another recent human study linked Splenda to diabetes-associated changes, calling into question its value as a non-calorie sweetener for those suffering with, or wishing to prevent, blood sugar disorders. “Sucralose alters metabolic parameters and its chronic effects on body weight are unknown”: both animal and human research indicates sucralose may raise blood sugar and insulin levels, indicating it may have diabetogenic properties. “Sucralose alters P-gp and CYP expression”: While classified as a food additive, sucralose’s organochlorine structure indicates it interferes with a wide range of organochlorine class drugs, and activates detoxification pathways and enzymes, in a manner similar to these xenobiotic chemicals. “Sucralose alters indigenous bacterial balancein the GIT”: Sucralose (delivered as Splenda) has been found to reduce the number of beneficial bacteria in the gastrointesintal tract (e.g., lactobacilli, bifidobacteria), while increasing the more detrimental bacteria (e.g., enterobacteria). One study found the adverse effects on flora did not return to normal (baseline) after a 3-month recovery period. Sucralose also altered the pH of the gastrointestinal tract. Chloropopanols are generated when sucralose was heated in the presence of glycerol. Chloropopanols are a group of contaminants that include known genotoxic, carcinogenic and tumorigenic compounds. Other chlorinated compounds formed when sucralose is heated in the presence of food include dibenzo-p-dioxins, dibenzofurans, dioxin-like polychlorinated bisphenyls and polychlorinated naphthalenes. Chlorinated compounds like dioxins and DDT are notorious for being both highly toxic and resistant to breaking down once released into the environment, which is why they are classified as ‘persistent organic pollutants.’ Splenda was launched in 2000 with tagline “Made from sugar, so it tastes like sugar,” until it retired this slogan in 2007 after settling with its rival, Merisant Co., the maker of Equal, who accused the makers of Splenda of intentionally confusing consumers into thinking its product was more natural and healthier than other artificial sweeteners. Long gone are the days that this artificial sweetener can be marketed as natural, safe and a healthy alternative to sugar. 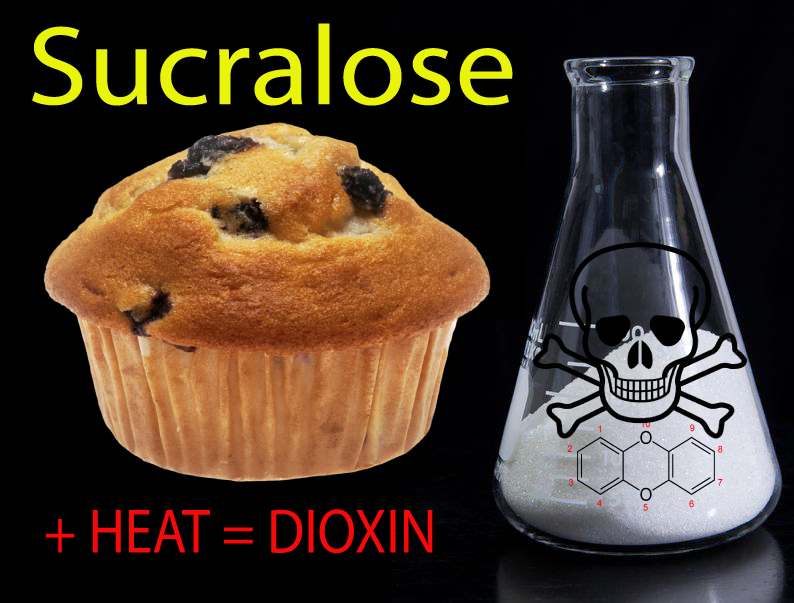 To the contrary, today’s research clearly indicates that sucralose is a toxic chemical that we should go to great lengths to avoid exposure to rather than something we should intentionally add to our food. You will also find a growing body of research that indicates that sucralose not only does not break down in the environment, but survives water treatment plant purification techniques, with the inevitable consequence that it is accumulating in concentrations in our drinking water and the environment that may adversely impact humans and wildlife alike. The discovery that thermal breakdown through cooking can lead to the formation of highly toxic and equally persistent chlorinated compounds, including dioxins, should raise a series of red flags for consumers, manufacturers and regulators as the information becomes more widespread. A cursory perusal of the World Health Organization’s description of ‘Dioxins and their effects on human health,’ which lists it as belonging to the “dirty dozen” of the world’s most dangerous pollutants, will see what is at stake here. For more information on the formation of toxic chlorinated byproducts following the heating of sucralose read a 2013 study published in Scientific Reports titled, “Polychlorinated dibenzo-p-dioxins and dibenzofurans formed from sucralose at high temperatures,” which goes into the topic in greater depth. Lastly, an equally concerning issue addressed by the paper is the problem of the acceptable daily intake (ADI). The FDA approved an ADI for humans of 5 mg/kg/day in 1998 based on toxicity studies in rats by determining a no-observed-effect level (NOEL) of 500 mg/kg/day, and then applying a 100-fold safety factor. Since then, research has emerged showing that the NOEL in the microbiome (‘gut bacteria’) of rats for Splenda is actually as low as 1.1 mg/kg/day – 454 times lower than first determined – and 3.3 mg/kg/day for changes in intestinal P-gp and CYP – 151 times lower than first determined. Therefore, if the biological effects of sucralose in rats and humans are the same, or similar, then significant effects would be expected in humans far below the ADI. Tagged splenda, sucralose. Bookmark the permalink.